Pyrolysis- A Chance for Current Ag Survival? Francis Thicke in his book A New Vision for Iowa Food and Agriculture has a chapter on Pyrolysis, which he defines as a process of heating biomass without oxygen to produce combustible fuel and a product called Blochar, a soil amendment, which increases soil fertilitory while sequestering soil carbon. You will recall our reference #52, a study by the University of Illinois, which found that every Midwestern State except one was losing soil carbon. If you look at the photos from Rodale Institute our reference #53 you will see visually that our widely used two crop agricultural system using chemical fertilizer causes depletion of carbon ie. organic matter/fertility and becomes highly erodible over time. In addition the only two studies ever done on manure spillage around chicken CAFOs in Maryland showed that spillage of manure after 20 years of operation caused aquifer nitrogen levels 200 times the normal background level of 0.3 mg/l which USGS has found to be 35% of nitrogen contamination in Delmarva aquifers. Pyrolysis of CAFO manure helps solve many of these problems and is the minimum that must be done if the CAFO concept for animal protein production is to survive. If the industry will not support this essential minimal first step it will accelerate its demise into the dustbin of history as predicted recently by a leading scientist. Note that the highlighted post provides a way to contribute to the Francis Thicke campaign in Iowa. A vote for Iowa is a vote for Delmarva which has a similar land use profile. Yesterday on Fox evening news there was an announced EPA ban on Meat showing a steak package with an X. The announcement was followed quickly with a disclaimer to the effect that while meat production was the primary cause of violation of the clean water act there was no fomal EPA action against meat production. 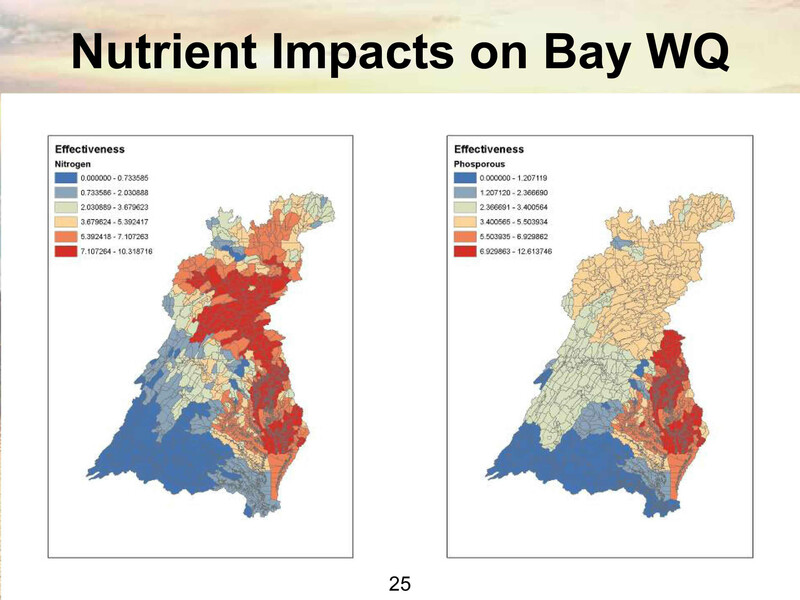 Clearly the EPA nutrient load charts for the Chesapeake Bay identify the meat producing and dairy CAFO’s of rural Pennsylvania and the chicken CAFO’s of Delmarva as the primary source of Chesapeake Bay pollution but this announcement on the 6 o’clock news was a false alarm. Despite being a dairy farm which has the potential to be a significant source of Chesapeake Bay nutrient pollution and despite that it is located smack in the middle of the deepest red nutrient pollution area of Delmarva, St Brigids Jersey dairy and veal farm is not polluting the waters of Chesapeake Bay. How can we be so sure? Owners Bob Frey and Judy Gifford have gone to extreme lengths to find out. They participated in a North East Sustainable Agriculture Research and Education grant to determine thr nutrient balance on their farm. The following is the calculation. The report indicated that they had a positive balance for nitrogen because they had to import grains to satisfy the high nutrient need of lactating cows and their acreage was insufficient to provide sufficient forage hay year-round. They now haul away the collectable manure. While they were confident that their pastures were not leaching nitrogen into aquifers because the grass is capable of scavenging sufficient excess nitrogen from the manure. They also checked their aquifers for nitrate which is the only way to be sure. It would be wonderful if every farmer showed sufficient concern about the potential for nutrient pollution to do a nutrient balance study and take appropriate action. If that happened voluntarily all the money being spent by the government and others would be saved. If that happened the Nations topsoil would not be destroyed and the waters would not be polluted and species destroyed. Congratulations to St Brigids for their leadership. We have asked another expert with USDA to check the probability of nutrient balance in the pastures of St Bridgids. His opinion will be posted under comments. Last time I checked the pricing of St. Brigids products they were reasonable compared to supermarket products. We will do a later pricing post. St Bridgids veal and beef is available at the farm and several area restaurants including Brookes Tavern in Chestertown MD. The Pew Commission Ref #1 stated that CAFO food products were not cheap except to the consumer because of government subsidies, and the cost to our natural resources such as our soil and estuaries like Chesapeake Bay. So it is interesting to compare the cost to the consumer. Yesterday I went to Walmarts to compare C&J prices. Walmarts price for Egglands best organic eggs was 4.08 versus C&J 4.00/doz. note Walmart had large eggs for 1.50/doz.. These eggs are produced by hens who live? in a small cage and are fed antibiotics, arsenic growth enhancer, and who knows what else. This system of egg production was condemned by the Pew Commission as being one of the worst examples of mans inhumanity to animals. This system of egg production is now banned in California and other States. Anyone who eats these eggs with knowledge of how they are grown should be jailed as an animal abuser. Considering that the beef has 7 times less saturated fat, is high in CLA and omega 3 and is grown in a way that builds topsoil, and is nutrient neutral, what a value! The only downside is finding these farmers. The eat wild website can be helpful in this regard. Just go to the related links on our website. You are currently browsing the archives for the Grass Farms category.